Suffolk County Legislator Kevin McCaffrey (R-Lindenhurst) recently participated in a meeting of the Lindenhurst High School Business Advisory Board (BAB). 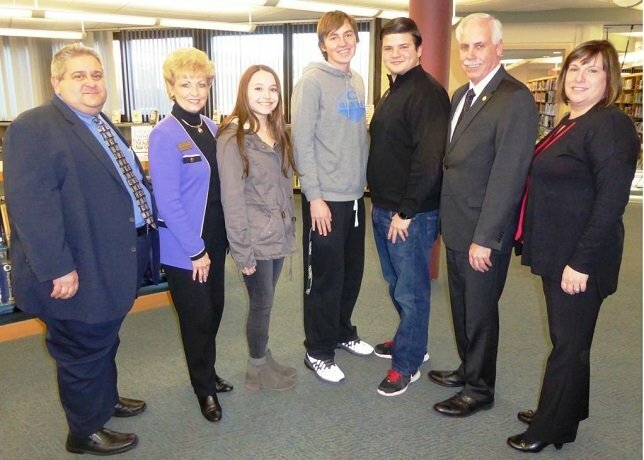 (left to right) Lindenhurst Superintendent of Schools Daniel Giordano; Jo-Ann Boettcher; Christina Cardino (LHS senior); Connor Lawrence (LHS senior); Nicholas Abbazio (LHS junior); Legislator Kevin McCaffrey; and Rose Truglio (LHS Business and Computer Science Educator). Photo by: Office of Suffolk County Legislator Kevin McCaffrey. Lindenhurst, NY - January 25, 2016 - Suffolk County Legislator Kevin McCaffrey (R-Lindenhurst) recently participated in a meeting of the Lindenhurst High School Business Advisory Board (BAB). The breakfast meeting took place in the school’s library, and it was attended by student leaders, teachers, and various members of the local Chamber of Commerce. The Business Advisory Board was created to build a stronger relationship between the school and business community in order to create career exploration opportunities for tomorrow’s workforce. In addition to establishing a vibrant network with the community and spearheading a number of programs, the BAB works vigorously to make the school’s curriculum meet the needs and expectations of the 21st century workplace. Legislator Kevin McCaffrey addresses the meeting. Underscoring the rapid changes in today’s economy, one of the speakers mentioned that those in kindergarten today may have jobs in the future that do not even exist yet. This is something that could be a little unsettling to some at first, but today’s educators are ahead of the curve and meeting the challenges head-on. To learn more about the Lindenhurst School District, particularly their current events and cutting-edge programs, those interested are encouraged to visit their website. Legislator McCaffrey represents Suffolk County’s 14th Legislative District which encompasses the Village of Lindenhurst, Babylon Village, the hamlets of West Babylon and North Lindenhurst, portions of Copiague, North Babylon, and Babylon’s barrier beach communities. Subject: LongIsland.com - Your Name sent you Article details of "Suffolk County Leg. 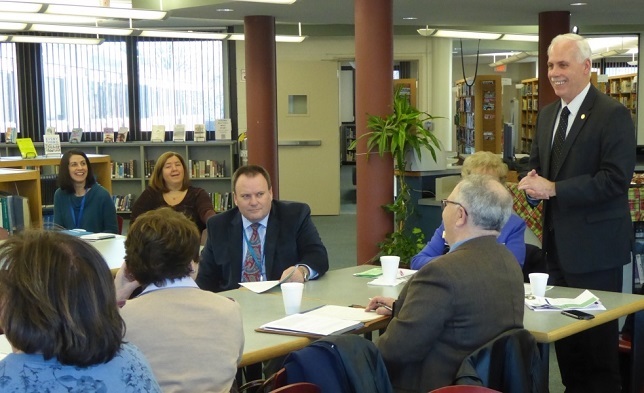 McCaffrey Participates in Meeting of Lindenhurst High's Business Advisory Board"